Take a look at the wonderful quilts on display in the quilting galleries -- think of the galleries as a huge online quilt show. Nearly all of the quilts in the galleries were made by members of the online quilting community. Some projects are from patterns but the majority of quilts were designed by each quilter. All of the quilts offer inspiration for your next project. 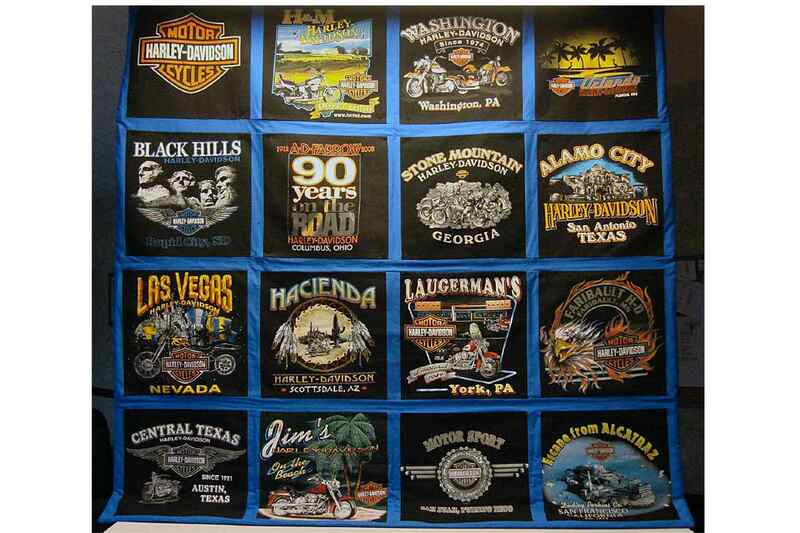 T-shirt quilts are a great way to create a memory quilt for your son, daughter, or any special person in your life. Give those old t-shirts a new life by making one of these fun quilts. Take a look at T-Shirt Quilt Tips and Techniques if you aren't sure how to create a project. All of these quilts were indeed created using a circular pattern, theme or motion. Some would be regarded as art quilts, some traditional... all of the quilts are lovely. All of these miniature quilts were made by members of the online quilting community, with the majority designed and stitched for a quilt exchange. You'll appreciate the creativity and hard work that went into the creation of these little quilts. The quilts in this photo gallery are one-patch quilts -- all made by repeating the same patch over and over throughout the design. Portions of a patch are sometimes used around a quilt's jagged edges, but that doesn't take away from it's one-patch status. Here's a nice sampling of some of the things you can do when you sew a rag quilt. The quilts are usually not difficult to make once you become accustomed to a totally backwards way of sewing. String quilts are assembled using freehand foundation piecing techniques. They're the perfect quilts to make from your leftover strips of fabric, and you can customize the quilt blocks in any way you like. Take a look at the whimsical string quilts in this gallery, and then use the string quilting instructions to make your own quilt. You'll enjoy looking at pictures of log cabin quilts, pineapple quilts, and quilts constructed using other similar designs. Log cabin quilts are sometimes made using foundation piecing techniques, but they can be sewn as you would any other patchwork, too. Freehand piecing is a popular assembly method when you want to make wonky log cabin quilts. Browse through pictures of scrap quilts. Many are the result of block swaps among friends. All are gorgeous and might give you some inspiration for your next scrappy project. Squares, squares, and more squares -- plus quilts that feature rectangles. That's what you'll see in this photo gallery -- a wonderful example that squares used in quilts are anything but ordinary! You'll love browsing through the star quilts in this collection. There are an endless number of star quilt blocks, and you'll see quite a few variations here. The quilts in this photo gallery aren't related in appearance, but they do have one thing in common -- each quilt conveys a specific theme or message. Quilters are definitely a creative bunch. These quilts are lovely. Samplers are made by choosing a specific number of different quilt blocks, sometimes 12 but often more, and using them to design a quilt. The applique quilts in this gallery sometimes fall into the landscape category, too, like the quilt shown here. Quilters used a variety of applique techniques to create these gorgeous quilts. Windowpanes for Bryse. © Pam E.
Attic Windows is a traditional design, but you can make it your own because there's no limit to the variations you can incorporate into your quilt. Joy, one of our Quilting Forum Hostesses, challenged members of the Art Quilts Forum to introduce themselves through literature in quilts. Each quilter chose a piece of literature that she loved and produced a quilt based on the work. Take a look at this gallery to see landscape quilts, pictorials and other types of art quilts. And don't be intimidated by the term art quilt, because anyone can make one, even beginning quilters. An art quilt is simply your own interpretation of any thought that your mind imagines. The quilts in this photo gallery were made to heighten awareness for cancer research and to remind us to check what needs to be checked. Some quilts are dedicated to specific individuals and some were donated to fund raising events. Other quilts were made by cancer survivors to chronicle their journey with the disease. You'll see lots of lovely Christmas Quilts -- and other quilts with a winter theme -- in this gallery of quilts made by members of the online quilting community.